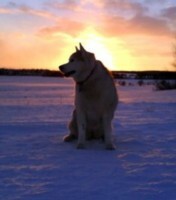 Husky silhouetted by Upton Farm sunset. As you can see by the tracks in the snow, this property is well-used by residents for recreational purposes all winter long. While the weather at times has been frightful, a core group of the Upton Farm Preservation Network Network continues to meet weekly. We have had discussions with provincial and city officials about the future of the Upton Farmlands, and we were keen observers of the Canada Lands presentation concerning the future of the Dominion Building on Queen Street in downtown Charlottetown. Please keep in mind that the Upton Farmlands are not saved nor protected yet. There is merely a moratorium on development. We depend on your support as discussions with various officials continue. On another note, if you’re in the mood (and the weather EVER cooperates) for a winter walk or snowshoe, with or without your four-legged friend, keep Upton Farm in mind. It has rolling hills for those who want a real workout and lots of straight paths for those who prefer more gentle exercise. This entry was posted on January 29, 2008 at 6:07 pm and is filed under Canada Lands Company, Environment, Pictures, Raising Awareness. You can follow any responses to this entry through the RSS 2.0 feed. You can leave a response, or trackback from your own site.